Note the large temperature range, from a high of 70° in 1951 (not an inauguration year) to a low of -2° for Reagan's second inaugural in 1985, the coldest inauguration in history. 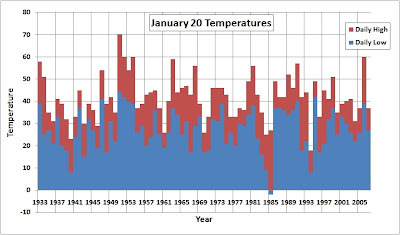 The long-term averages of 42° for a maximum and 27° for a minimum are equal to the coldest of the year in Washington. The record precipitation for the date of 1.77" fell in 1937. An inch or more also occurred in 1979 and 1988, with 1995 close behind at 0.99". 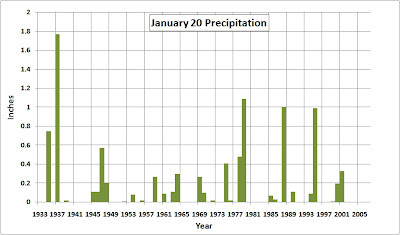 In all, 39 out of the last 78 years since 1930, or exactly 50%, have had at least a trace of precipitation on January 20. The maximum snowfall on the date was 3.8" in 1975, although 7" fell the day before Kennedy's inauguration in 1961. At least a trace of snow fell in 23 years, or just under 30% of the time. Of those, 17 had measurable amounts, and 1" or more was observed 9 times. The maximum amount of snow on the ground was the 8" in 1961. There has been a trace or more of snow on the ground in 25 of the years since 1930, and 19 of those had at least an inch. So, the bottom line of inauguration weather history is: If you're planning to attend the events, particularly those outdoors, be prepared with a variety of clothing and footwear. ClimateScienceWatch notes that President-Elect Obama has stated in writing, "In an Obama Administration, the principle of scientific integrity will be absolute. I will never sanction any attempt to subvert the work of scientists." Transition advisers to President-elect Barack Obama have compiled a list of about 200 Bush administration actions and executive orders that could be swiftly undone to reverse White House policies on climate change, stem cell research, reproductive rights and other issues . 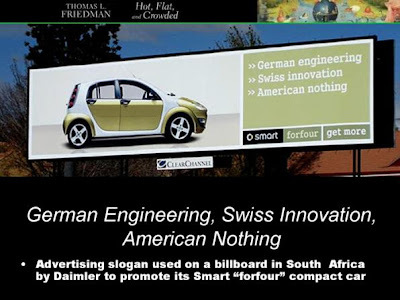 . .
One potential target for reversal mentioned in the article is the Bush Administration's refusal to grant California a waiver to allow regulation of greenhouse gases from automobiles. The N.Y. Times has a similar report, Obama Weighs Quick Undoing of Bush Policy. Today's Forecast: "Hot, Flat, and Crowded"
Author Thomas Friedman's recent lecture presented by Politics and Prose in Washington, DC, is available as a streaming webcast. Copies of the PowerPoint slides are included. After making landfall on the southern coast of Cuba Saturday evening, Hurricane Paloma weakened rapidly, becoming a tropical storm by 7 am today. Late this afternoon, the storm was downgraded to a tropical depression. As of 4 pm, maximum winds are down to 35 mph, and further weakening is expected through tonight. Tropical Depression Paloma is barely moving toward the north at 1 mph, and a slow northward drift will keep the storm or its remnants near the north coast of Cuba on Monday. Additional rains of 1 to 2 inches are forecast over central and eastern Cuba and the Bahamas.